I'm probably going to four star parties this summer: The Jeffers Starry Nights (JSN), the Nebraska Star Party (NSP), the South Dakota Star Party (SDSP) and Iowa Star Party (ISP). I'm hoping to do quite a bit of imaging at these, taking advantage of the dark skies and slightly more southern locations. It's not much, but every degree of elevation helps! I'd like to bump along my Bright Nebula list work, and take a couple of pretty pictures, too. The dark locations let me image reflection nebulae that I can't get from my light-polluted back yard. Another constraint is that whatever scope I bring to Jeffers will also be the one I use at NSP. So what should I image? (1) I'd like to go really deep on the Iris (NGC 7023). It's a reflection nebula on the list, and it's pretty. Near by are some barely luminous clouds. A wide field shot with my AT65 will take them all in. The Iris a better target during the JSN/NSP time period than in late August. This would be a multi-hour object, to say the least. 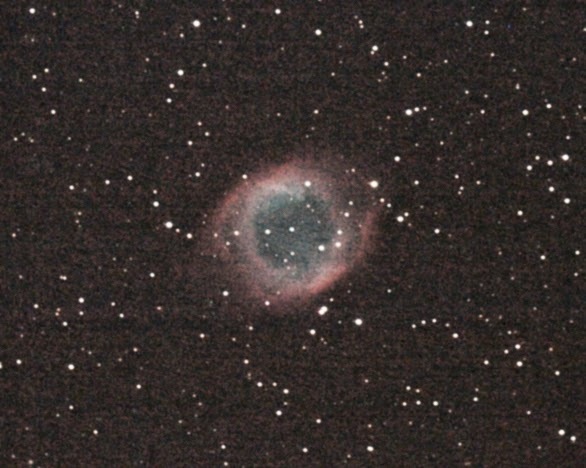 (2) I've always wanted a good image of the Helix nebula (NGC7293). This is better imaged around labor day, so it should be during either the SDSP or ISP. ISP has darker southern sky, so that's where it will be imaged. The C925 produces a nice image scale for it. The Helix from 2009 JSN. The above is my only Helix image, taken using my TV102, an unmodded Canon DSLR, 16 x 180s @ ISO 1600. Not at all adequate. A few hours (or longer) of LRGB could be much better. (2a) Other objects I would like to go really deep on are the Ring--see a previous post about the outer shell-- and the Dumbbell. Those would be best in the C925. (3) I have only one so-so image of the eagle nebula (M16) from a couple of years ago. Unfortunately it doesn't include the portion of the nebula that's considered LBN 68, a list item. So that should be reimaged from a dark site. This would probably look better in the C925 but the wide field of the AT65 would be adequate. Best during JSN/NSP. (4) There are a good number of large list items in Scorpius and Sagittarius that would image well in the AT 72. These should be imaged at JSN/NSP. These include Sh 2-13, 2-16, NGC 6334, IC 4628, IC 4701 and LBN 52. An hour each should produce images that could satisfy list requirements. JSN and NSP get the Iris and the large list items. This means that I can travel to them with the smaller, lighter AT65. One pretty picture (Iris) and a flock of list items. SDSP and ISP get the Helix, Ring, Dumbbell, and whatever else comes along. For those it's the C925. Pretty pictures all, and perhaps list items left over from July. Now it's all up to the weather!